"ISL worked with Framestore and McCann NY to create a groundbreaking, immersive experience for Lockheed Martin that transported kids to Mars during the USA Science & Engineering Festival in Washington, D.C. To deliver this award-winning campaign, we bought a school bus and built The Field Trip To Mars — an interactive simulated “group VR” experience along the surface of the red planet. This experience was one component of Generation Beyond, a multi-year national educational program designed to inspire the next generation of innovators, explorers, inventors and pioneers to pursue STEM careers. ISL was also responsible for designing/developing an interactive website, which would serve as a second major component of Generation Beyond and compliment the Mars Bus experience for children in the classroom. My role on this project was the lead designer of the unity-based interactive experience of the campaign. 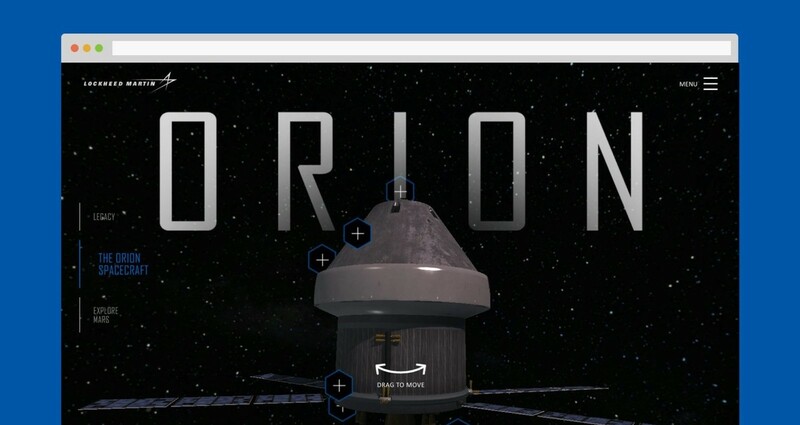 I worked closely with our Creative Director and engineering team to create an exciting web experience for users who couldn’t see the bus in person — or, who wanted to see the Orion and Mars models more up close after their VR experience. Lockheed Martin’s objective was to encourage excitement about STEM fields and show how awe-inspiring space can be, highlighting the statistic that the first person to go to Mars is likely in school right now — we just don’t know who they are yet. Our objective was to create a campaign as big as their mission, and generate excitement from both kids and parents. The website focused on three things: the history of space exploration, and two highly intricate models of Orion and Mars that users could explore in 3D and see detailed features of. This project was a tough one because of both the short timeline and the technology we were building with on that timeline. Unity was perfect for the website because it let us highlight the incredibly detailed Orion and Mars models at the center of the campaign, but it had performance implications as well as developer resourcing challenges associated with it. We designed the site in such a way that performance was optimized and that we could build the site on time — quite a feat in itself for our development team.